Announcement on the release of "3DFF-222"
"Active in a wide range of applications including in-house production of print jigs, creation of three-dimensional signs, and manufacturing of molds for vacuum forming"
Mimaki Engineering Co., Ltd. (Mimaki), Headquartered in Nagano Prefecture, Tomi City; President, Kazuaki IKEDA, announced the release of "3DFF-222", a 3D printer co-branded by Sindoh (South Korea), available from the end of April 2019. The 3DFF-222 is a desktop 3D printer using FFF (Fused Filament Fabrication) technology (*1), and forms objects of sizes up to 210 x 200 x 195 mm (8.27 x 7.87 x 7.67 in) (W x D x H). Not only building geometric samples or prototypes, the printer, when used in combination with our flat-bed UV printer, also allows customers to have various propositions that will help their print business. If you use a unique print jig that can be created inexpensively, it contributes to stabilized print quality and reduced jig creation costs. Also, by making a formed object decorative using our UV printers, you can create a three-dimensional full-color indoor sign, which is highly eye-catching. In addition, by making use of the formed object as a mold for vacuum forming, speedy and cost-cutting prototype production is realized. The genuine PLA filament can be applied for molding filament. PLA stands for Poly-Lactic Acid (polylactic acid), a plant-derived eco-plastic made from corn and potato starch as raw material. It is suitable for creating jigs from the characteristics that it is hard and hardly warp. *1 FFF method…A method for forming 3D objects, which uses a filament of plastic resin which is molten by heat, extruded from a nozzle, and deposited layer by layer. 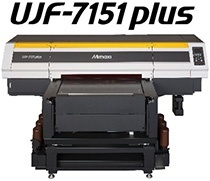 When printing with “UJF-3042/6042MkII” or “UJF-7151 plus”, a print jig is used to fix the workpiece. However, a unique custom-made item that would be costly is often printed without such jig, and this can result in difficulties in positioning or leveling. 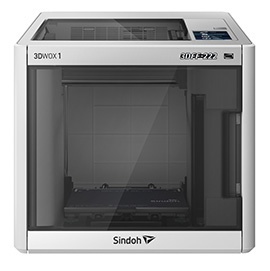 Using the "3DFF-222", you can create a unique print jig in-house, which realizes reduced manufacturing costs and stabilized print quality due to in-house production. By using our UV printer that enables direct print on three-dimensional indoor signs and channel letters formed with the 3DFF-222, you can create highly eye-catching full-color signs. Printing is enabled for an object with irregularities when you use the "LD mode" print function of our UV printer, which maintains high quality even for a height difference of up to 4 mm (0.1575 in). Using the 3DFF-222, you can form molding tools that are needed for creating vacuum-molded products. There is no need to perform special processing such as making holes in the formed molding tools. 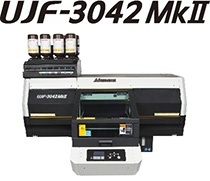 Printing on the films to be shaped is enabled with “LUS-350” flexible ink that can be mounted on our “UJF-7151 plus” and “JFX200-2513”. It is suitable for extremely small-lot molding, prototype production etc. You can complete filament installation by just inserting a reeled filament in the dedicated cartridge and setting it to the main unit. By this alone, the filament is supplied to the nozzle automatically. No conventional troublesome work is required such as passing a filament through a tiny hole. Auto filament cutting is also possible after using the printer, allowing you to reduce the bothersome operation significantly. By slightly bending the modeling table (bed), it is possible to remove a modeling object from the bed. Unlike those 3D printers that require you to remove objects using a scraper, you can work safely. Also, the modeling table (bed) has a built-in thermostatic function that enables stable formation. It is a key point of perfect modeling for any 3D printer to keep its printing table (bed) horizontal. 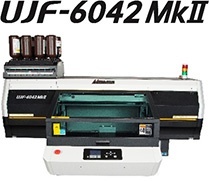 The 3DFF-222 automatically measures the horizontal error of the table and gives instructions to the color monitor to maintain a horizontal position. This allows for the constant horizontal level of the table and enables stable formation. A camera and LED light are mounted for remotely monitoring the process of formation. By just installing a mobile app to your smartphone or tablet computer, you can check the progress of formation from anywhere you desire. HEPA (High Efficiency Particulate Air) filter is a high-performance filter used in the fields requiring air cleaning. The 3DFF-222 adopts this filter to provide a mechanism that prevents the discharge of foul air. A motor driver with superior performance is adopted to reduce the noise level to 45dB (almost the same level in a museum) during 3D molding. The sound of 3D printing no longer distracts people doing other work next to the printer.